December 18, 2015 (El Cajon) -- Country music singer Travis Tritt will be performing at Sycuan Casino & Resort in El Cajon on January 24 at 7 p.m.
Tritt released the album through the label he formed in July 2013 called Post Oak Recordings. Included on The Calm After… is a duet with Tritt’s 15-year-old daughter, Tyler Reese. The song, “Sometimes Love Just Ain’t Enough,” is a cover of the 1980s pop hit. 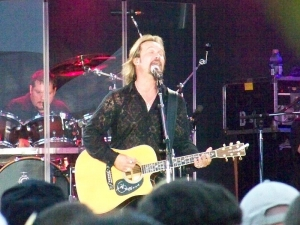 Four of the songs on the album, co-produced by Randy Jackson, were either written or co-written by Tritt. Most recently, Tritt released a new song to Country radio titled, “That’s What Dreamers Do.” The single was inspired by the independent biopic film “As Dreamers Do,” which is narrated by Tritt. “That’s What Dreamers Do” is now available through iTunes and www.TravisTritt.com.